Over 10 years I have worked at this particular company and today I went home early for the last time. It is a pity there is bitterness on both sides as the “professional relationship” broke down. I know no-one likes their job, but I honestly used to and unfortunately didn’t anymore. The plan is to reboot, clear my mind of all the garbage it has put up with recently and then decide what I want out life. All I can say to those still left in purgatory is I wish you the best and hopefully some get what they deserve. 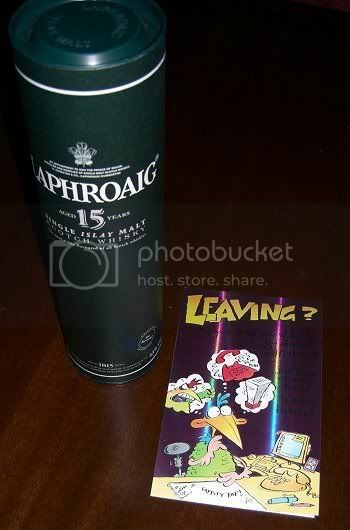 Thanks for the bottle of whiskey and the card.